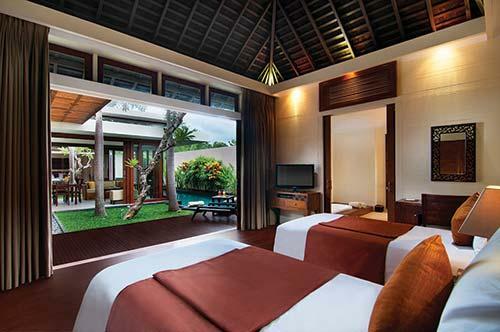 Anantara Vacation Clube Bali Seminyak is part of the Interval International (II) network and part of the BGV II resort highlight series. 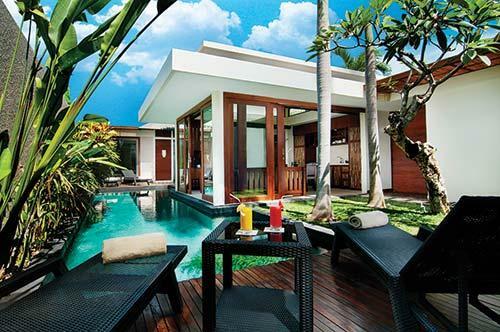 Let’s talk about Bali, Indonesia. It is absolutely gorgeous and if you are into the Caribbean or Mexico then Bali is certainly up your alley. With amazing food, exciting hikes, and historic places to visit, this island is a must for vacationers. The resort that caught my eye is the Anantara Vacation Club in Seminyak, Indonesia, a small 18-villa resort perfect for that private getaway you might be looking for, for a honeymoon or an anniversary. The villas, separated by grasses and other plant life, have a classy modern décor with aquatic features winding throughout the property. 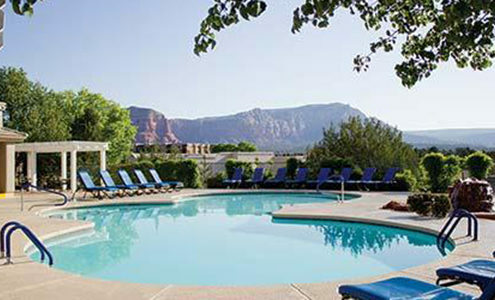 Inside the rooms are private plunge pools and outdoor showers that are simply divine. One of the best features about the Anantara Vacation Club is the location – quiet but still within walking distance of town and an abundance of restaurants that offer dishes ranging from Asian to European cuisine. The only downside is that this is not a beachfront property – but they do provide free shuttle service to one of their sister beachfront resorts. Besides relaxing, there are hikes and cultural places to visit such as the Petitenget Temple or the Barong Dance and Kintamani Tour, introducing you to the fascinating Bali culture. Get up and close to the exotic marine life with a snorkeling excursion or learning how to scuba dive. Simply put, Bali is not just for backpackers anymore, but rather a world-class destination that is booming with tourism and all types of vacationers. The natural beauty of Bali is unique and full of wonder and if you are looking for a remote and tranquil haven, then Bali is a top destination to visit.